Dubai known as the economic hub of trade activity and tourism has not always been like this. Dubai is one of those rare places in the world that can be declared to be man built. The history of this emerging city dictates how its true potential has been untapped over the year and how it continues to tear away from its boundaries. The huge supply of oil, which is currently perhaps the most precious resource for man, managed to change the reputation and significance of this land overnight. Dubai soon transformed from a simple trading port to an international center of trade and commerce; attracting the attention of entrepreneurs and visionaries from all across the world. Today Dubai has grown to be a metropolitan and lavish city. Dubai is not only serving to provide entrepreneurs a great market to invest their funds in but is also proving to be popular among tourists. The city contains the finest of hotels, resorts, restaurant and theatres lit by international entertainers from all across the world. 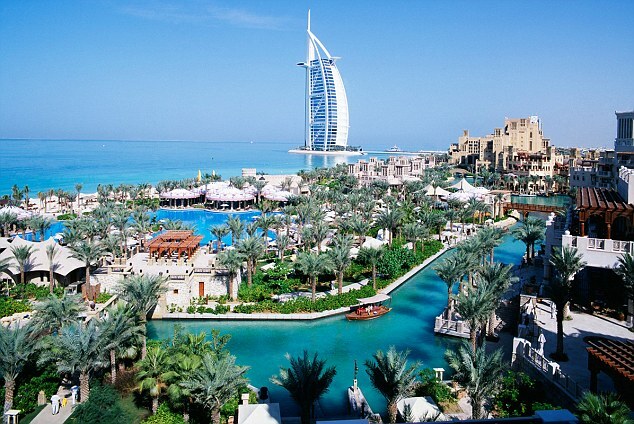 Dubai is a vacationer’s paradise, located on the Persian Gulf Coast. The city offers: adventure sports, restaurant presenting cuisines from every part of the world, mind blowing architectural structures and glamorous shopping festivals – The developments being made in this city simply meet no limits! If you’re going on a family vacation or still possess the soul of an adventurous child, then be sure to check out this one of its kind, Amusement Park. It has some of the most thrilling rides, games and sports accompanied by a uniquely designed water park. It serves as an ideal getaway for tourists from the summer heat. Known for its hot climate, the people of Dubai are just looking for ways to beat the heat in the scorching summer days, but this unique restaurant takes things to a whole new level. Chillout is a restaurant and nightclub in Dubai that has been entirely constructed out of ice! How’s that for keeping you cool? The Dubai fountains are just one example of the architectural wonders this city displays. This fountain is definitely a must-see because the water streaming out of it is choreographed and synced with music. The movement of the water follows the rhyme of the music and the result is simply marvelous. While being classy and elegant this fountain is just as thrilling to watch, because the water shooting out of the fountain can go up to 500 feet high! If you visit Dubai and miss this architectural masterpiece then you really missed a big portion of the city’s true identity, which is unanimously believed to be the pivotal structure of Dubai’s extraordinary skyline. Be sure to visit this building and feel the thrill and adrenaline rush of looking down to the ground from the tallest building in the world! If you want to experience something new and get away from all your fast-paced city life then take a trip across the empty Arabian Desert. Experience what it feels like to be amidst miles and miles of sand and how people in the olden days moved across these deserts on camel backs. There are many guides who offer tours across the deserts and also entertain visitors by camping with them in a nearby remote village – Giving them a taste of the simpler life, with live barbequed food, local and live entertainment and a priceless view of the stars; away from all the city lights, the noise and the stress. After its magnificent architectural structures, Dubai is perhaps most popularly known for its extravagant shopping and food festivals. The shopping malls in Dubai are unlike anything you experience in native countries. They are simply limitless and possess the ability to contain everything a person could possibly want to do for entertainment. You can expect to find all your favorite brands and international outlets, restaurant of varying types offering all the cuisines you could possibly think of, cinemas showcasing the latest releases, indoor ski centers, museums, rides and even aquariums – These malls are a shopper’s paradise! Being one of the most visited tourist destination in the world, Dubai consists of numerous hotels of varying standards to accommodate the needs of all types of visitors; ranging from the classy 5 star ones to the more comfy and affordable ones. Located on the Palm Jumeirah Island, the Atlantis Hotel is particularly popular among tourist for its ocean themed resort that gives it an edge from the other more classical resorts. The hotel offers free access to their water park, underwater city-style aquarium and gives visitors a unique opportunity to swim with Dolphins! This resort is ideally designed for those tourists who are looking for a beach vacation. Located right next to a 1.2 km private shoreline and possessing a breathtaking view of the Persian Gulf. While staying here, you will have easy access to all the water sports and activities the resort has to offer. Dubai International Airport is perhaps one the busiest airports in the world and is well known for its duty-free shopping. So while you’re waiting here, you might want to make a trip to the gift shop. Once you land, you can easily find a taxi at the terminal, fares typically starting at 25AED (Rs. 700). Taxis have a different appearance in Dubai. Instead of yellow colored cabs they have a distinct cream colored shade and even pink colored ones that are reserved for only ladies. Taxis are deemed to be relatively safe in Dubai and they are well regulated by the government making them an affordable and comfortable mode of transportation.